“Now there was no smith found in all the land of Israel to make swords and spears.” — I Sam. 13, 19. Tools, now-a-days, are mostly bought. 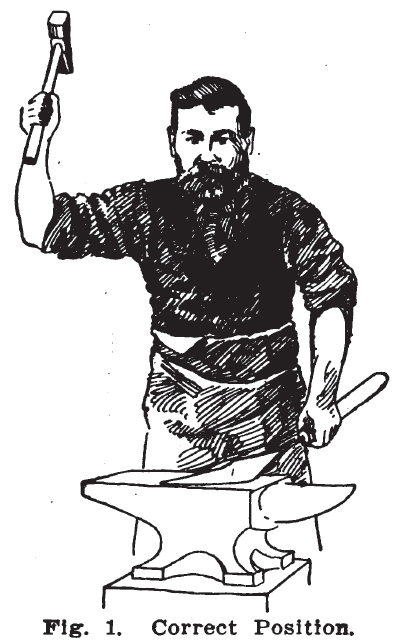 The smith even buys his tongs and chisels; but it is so in regard to almost everything that is used by the smith in his trade. It is ready made, and sold by the manufacturers. The result is that we have smiths who are not smiths. The first thing for the amateur smith, as well as the apprentice, to learn, is how to use the tools; also how to place them. Most of our blacksmith shops lack order. The forge and the anvil are so crowded together that it is almost impossible to get in edgewise between them. And in most cases the anvil is placed too high. The distance between the fire — not the forge — and the anvil should be from six to seven feet. 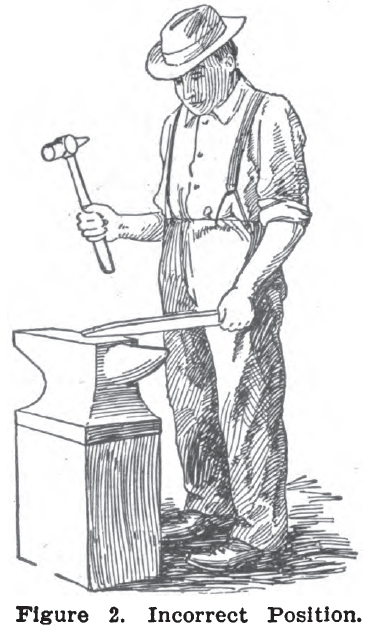 The anvil should be just high enough to touch the knuckles of the smith’s hand when it is closed and the smith stands erect at the anvil. This will give the right height for all smiths. The anvil block should be a square block, the size of the foot of the anvil, and not like the chopping block in a butcher shop, as we often find. Nothing can be more awkward than a large block with all kinds of tools on the anvil in the center, and the smith stretching out in a half circle, trying to reach out far enough to reach the anvil. When we see a mechanic with these arrangements, we know he is rated in the third class. Correct position and composure of the body must be attained — First, for the ease it gives in performing the work, second, it lends grace to the movements, which we should strive to gain, for it is very painful to look at an awkward mechanic, and such a workman will never succeed as well as the easy workman, whose movements are both correct and graceful. In looking at Fig. I above, you see a smith with free and easy position. Fig. 2 is the opposite to this. Here is a third-class man. Just mark his awkwardness. He presses his elbows against his rib. When you see a smith of this kind, you can rest assured he would not command a very high salary if he were to work for another, for he is a ”bundle carrier”; that is, he squeezes his arms against his sides as if he were afraid he would drop something. It is generally the case that he also turns his toes in, forming a triangle.